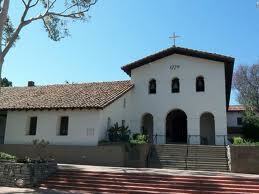 Mission San Luis Obispo de Tolosa was founded 1 September 1772 (5th in order) by Blessed Junípero Serra. The mission is named for Saint Luis, Bishop of Toulouse. The Indian name was Tishlini. The mission is the halfway point in the chain and is often called the “Prince of Missions.” Because of flaming arrows, the mission was built with tiles; the first roof tiles made in California. In the late 1800’s the mission was remodeled as a parish church; a New England steeple was even added. The steeple was removed and the mission restored in 1934. The church is active.